From start to finish, the first half of Notre Dame’s national championship loss to Connecticut on Tuesday night was filled with turnovers. Just over 40 seconds in, Huskies freshman guard Kia Nurse stole the ball from Irish sophomore guard Lindsay Allen. Nearly 19 minutes later, junior guard Moriah Jefferson picked junior guard Hannah Huffman’s pocket. In between, the Irish (36-3) surrendered the ball 11 other times, leading to 10 points for Connecticut (38-1). Along the way, they lost their only two leads of the game and fell into an eight-point hole from which they would never escape. Almost every Irish player fell victim to rash of turnovers, with only junior guard Jewell Loyd maintaining a clean sheet. Allen, who was top 30 in the nation entering the game in assist-to-turnover ratio, gave up the ball four times and added just one assist. Part of the issue, junior guard Michaela Mabrey said, was due to nerves of less experienced players. Notre Dame’s freshmen who saw the court in the first half agreed. “I think it just comes along with being in the national championship game and being a freshman,” freshman forward Kathryn Westbeld said. Westbeld and Turner had three combined turnovers on the night in 23 total minutes, while failing to score a single point. 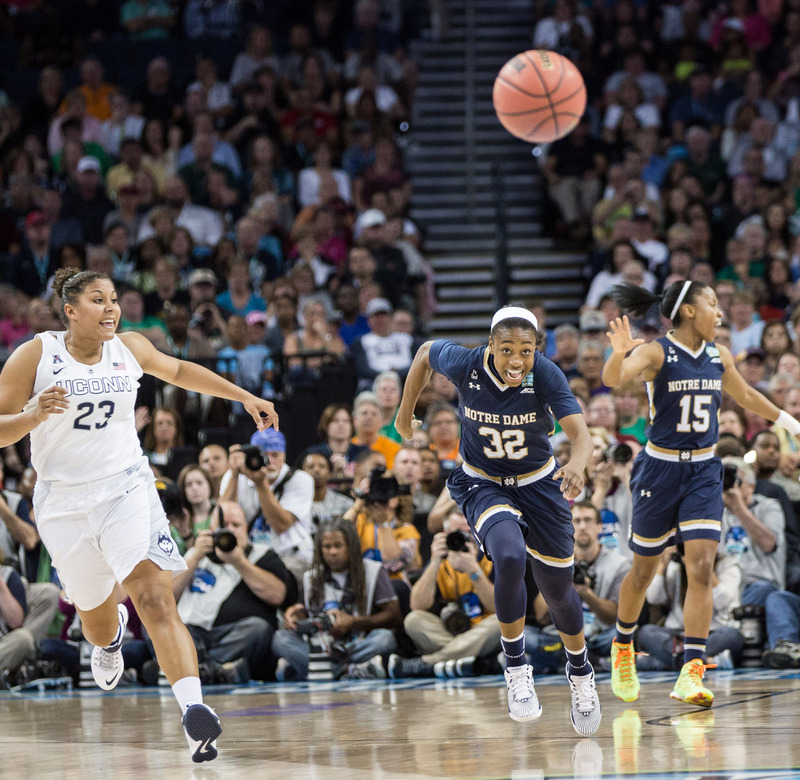 Loyd said the turnover problem resulted from early excitement causing the Irish to abandon their usual style of play. Once that happened, Notre Dame had trouble getting back on track and matching the Huskies. And after those turnovers occurred, Notre Dame failed to get back on defense and could not stop the Huskies from scoring twice as many fast break points as the Irish did (6-3). Connecticut shot 38 percent from the field and 23 percent from 3-point territory in the first 20 minutes of the game, but had four more attempts from the field and 10 more from long range. Irish head coach Muffet McGraw said she was pleased with her team’s halfcourt defense throughout the first stanza but emphasized at the midway break that if Notre Dame was to come back, it needed to take care of the ball. While the Irish did take better care of the ball in the second half — just four turnovers — Notre Dame could not come back as Connecticut began to heat up from the field. Meanwhile, the Irish could not force any turnovers of their own and continued to struggle in transition defense. “Transitions and turnovers, that’s where all their points came from,” Mabrey said.